I finally picked up my bees on wednesday. I guess i can now call myself a bee keeper. Yeah! I waited until today to move them from the travel hives into mine. I know i could have done it sooner but i didnt have time. I have been watching them, some might consider it stalking just to be sure they where ok. They are my first bees i want to be sure i am doing it right. They seam to be so gental that i desided to move them without smoke. The smaller of the to hives where so quiet i almost didnt here them. I could see some caped and uncaped young but no eggs. Im not all that worried i am not all that good at spoting the eggs they are so small. No sign of the queen either but she isnt marked yet. The had about a frame and a half of honey. They will need to build up more. 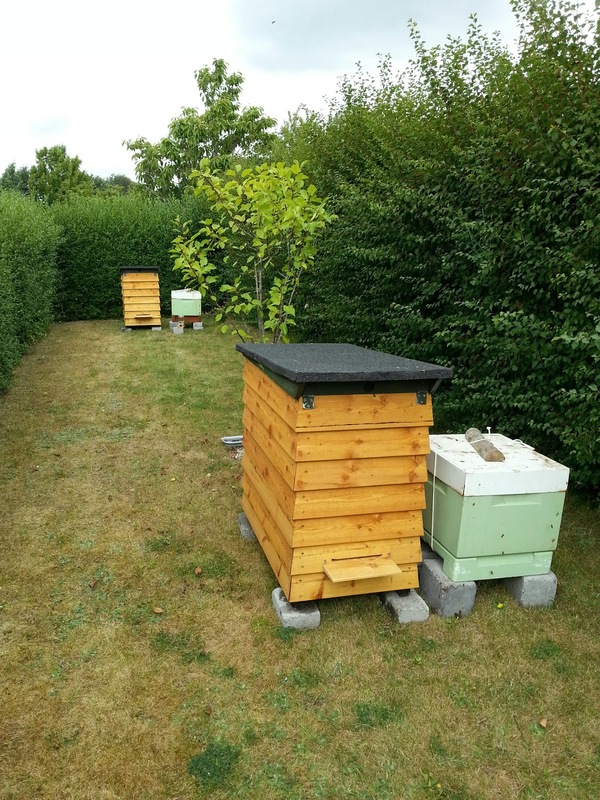 The second hive was bigger. You could here them but. I could see eggs here and loads of caped broud. No queen but where there are eggs there must be a queen. They had 2 full frames of honney wow it weighs a lot. Not at all worried abiut these guys they seam very strong and happy.